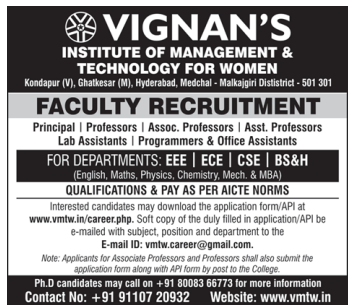 Vignan's Institute of Management and Technology for Women, Malkajgiri has advertised in the EENADU newspaper for recruitment of Professor / Associate Professor / Assistant Professor / Principal Plus Non-Faculty jobs vacancies. Interested and eligible job aspirants are requested to apply as soon as possible from 17th April 2018. Check out further more details below. About College: VMTW is an exemplary institution of higher learning with a mission of pursuing excellence in education and research. The institution, with their diverse and dynamic community of about 2000 students offers a distinctive combination of some of the finest facilities for MCA, MBA and M.Tech. with 5 different graduate, and undergraduate programs ECE, CSE, EEE,IT,CIVIL accomplished faculty, world class facilities with hostel set on a sprawling area of 22 acres sylvan surroundings of mango groves and greenery. How to Apply: Interested and eligible candidates are requested to download application form, fill and send it along with copies of certificates and recent PP size photo to the email address provided below.